The resilient Laika Studios delivers another wonderful stop-motion animated adventure. Lots of fun, MIssing Link takes viewers on a global adventure, mixing humor, emotions, and adventure in a tremendously entertaining way. Anyone who enjoyed ParaNorman, Coraline, Kubo and the Two Strings, and The Boxtrolls, knows what to expect from Laika Studios and Missing Link is unique, clever, and visually stunning. The script can get a little messy and viewers may wonder if Hugh Jackman’s character is a good guy or just a smarmy manipulator? Some have called the film boring, and its energy, built around an arrogant main character and a sentient creature who is kind-hearted and nice, may not work for everyone. Though family-friendly and PG-rated, Missing Link has a few scenes of intensity, which may prove to be upsetting for the youngest of viewers. 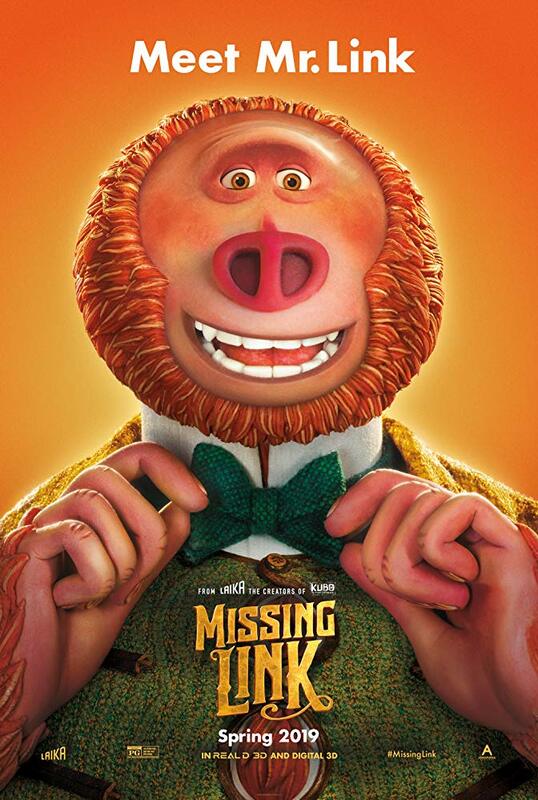 Maybe this all worked way too easily on me, but the madcap energy and slapstick vibe of Missing Link had me smiling from ear-to- ear. Hugh Jackman’s voice puts life into the enigmatic, mile-a-minute manipulator, Sir Lionel Frost, who sees expeditions and adventure as a way to fame and fortune. He also covets membership in the exclusive Optimates Club, where he believes finding the existence of a new animal species will earn him lifetime access. Frost is not respected, certainly not by Optimates Club leader Lord Piggot-Dunceby (Stephen Fry). And after a chaotic altercation, Frost vows to prove that a porcelain footprint of “Bigfoot” is proof that a mythical creature is real and exists. A curious letter leads Frost to the Pacific Northwest. Soon, truth and fiction blur together when he finds a sentient creature, temporarily named Mr. Link (Zach Galifianakis), who has ulterior motives for letting Frost find him. He has seen evidence of Yeti and wants to meet his family. Written and directed by Chris Butler (ParaNorman), Mr. Link is a kind, charming character, easy to become enamored with. Galifianakis voices him with a youthful innocence that serves as a nice counterbalance to Jackman’s braggadocio and dim-witted arrogance. Frost needs a map to get Mr. Link where he wants to go. And it is held by the widow of a former colleague, and former love interest of Frost’s, Adelina Fortnight (Zoe Saldana). Together, the trio embark to Shangri-La, nestled in the Himalayas, to make all this quest a winning one for all involved. Of course, misadventures and conflict arise, and Missing Link provides a nice balance of humor, action, and mild suspense. The energy is largely unrelenting. Butler pushes the pedal down hard in moving us through scene-by-scene, at times a little too quickly, but matching the urgency of the story being told. The animation is breathtaking, and Laika has seamlessly blended stop-motion animation with CGI enhancements in such a manner with which it is impossible to separate the two. The craftsmanship on display rivals that of a Wallace and Gromit story, the attention to detail rivaling no one, except perhaps the hand-drawn work of Studio Ghibli. This is masterfully made and Missing Link is truly an achievement that pushes the art of animation forward in new and exciting ways. If there are weaknesses, the story feels a bit dated and may be a little tough for younger viewers to engage with. Frost is something of a lothario, a fact briefly mentioned and glossed over, and not always the easiest character to celebrate and root for. Saldana’s character is not given a whole lot to do, save for her first few scenes, and is largely a counterbalance to Frost’s bombastic nature. There is some cartoonish gun violence, largely involving bounty hunter Willard Stenk (Timothy Olyphant), sent to disrupt Frost’s quest by any means necessary. Jackman does radiate joy in his voiceover performance, sounding as if he is having the time of his life being so over-the-top and “big” on screen. Galifianakis’ performance is simply wonderful. His take on Mr. Link is one of kind-hearted emotion, vulnerability, and innocence, and young viewers are going to respond to him tremendously well. And that is really where Missing Link hits its marks, making a connection with its viewers. Though a few action scenes are intense, and some families may bristle with guns as weapons of choice (true to the time period, but necessary in 2019? ), there is still plenty to enjoy here. Full of madcap energy and gorgeous animation, Missing Link proves that Laika Studios’ grit and determination in making films their way reaps great rewards for those who invest the time watching their unique and ever-evolving slate of films. Featuring the Voices of: Hugh Jackman, Zach Galifianakis, Zoe Saldana, Emma Thompson, Stephen Fry, David Walliams, Timothy Olyphant, Matt Lucas, Amrita Acharia.